After an absence of three years, and several personal trials and tribulations, Austria's Edenbridge arrives with their eighth studio album, The Bonding. Edenbridge has never done anything half way or half-heartedly, sideways or otherwise. So what could the band do to turn the knobs to 11 for their grand symphonic power metal? How about recording with a full orchestra to make those symphonic parts sound even more grand than simple synthesizer twiddling? Through the support of fans and sponsors, Edenbridge was able the Klangvereinigung Orchestra of Vienna to push the band's already impressive symphonic sonics to the stratosphere and beyond. Is this to say that this substantial addition makes The Bonding great, even more spectacular than previous Edenbridge outings? Well ... yeah. 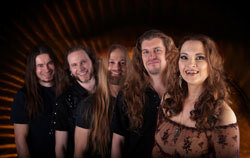 There are oodles of melodic symphonic metal bands, many with female lead vocalists, producing their large bombastic sound. Putting the orchestra into the symphonic seems like a no-brainer. Edenbridge gets it right. The orchestra, the symphonic parts of the arrangements, are exactly that, a part of each arrangement. They neither lead nor smother any song, but they certainly add authenticity to Edenbridge's chosen style. The opener Mystic River is a perfect example of this balance. And you still get nice keyboards, big riffs and even bigger solos, and Sabine Edelsbacher�s voice, which sounds better than ever. She's smooth, controlled, clear, and simply powerful. Listening to her on Alight A New Tomorrow, The Invisible Force, or Death Is Not The End, by example, are impressive as they are inspiring. Perhaps we've hit the highlights of The Bonding. All these elements find their culmination, apex as it were, in the title cut which closes the album. It's better than 15 minutes of symphonic melodic power metal bliss. It also features Ms. Edelsbacher in duet with Erik Martensson (WET, Eclipse). Holy shiite! What an awesome combination. The song also displays that aforementioned balanced, more than nuanced, of the orchestra for the symphonic parts with entire arrangement. Principal composer Lanvall desires major kudos for this musical score. The Bonding is grand, engaging, and entertaining, more than a little epic, melodic symphonic power metal from a terrific band. Is it their best album yet? Could be. Strongly recommended. Edenbridge's The Bonding is grand, engaging, and entertaining, more than a little epic, melodic symphonic power metal from a terrific band. Is it their best album yet? Could be.